As part of our school project in Arduino, we have the mobile application part, and we used corona to build it cause I'm familiar with the platform, we must use windows phone 8 (project limitations :\ ), so we ended up using Corona Cards. //       You can change the defaults via the CoronaPanel's AutoLaunchSettings property. 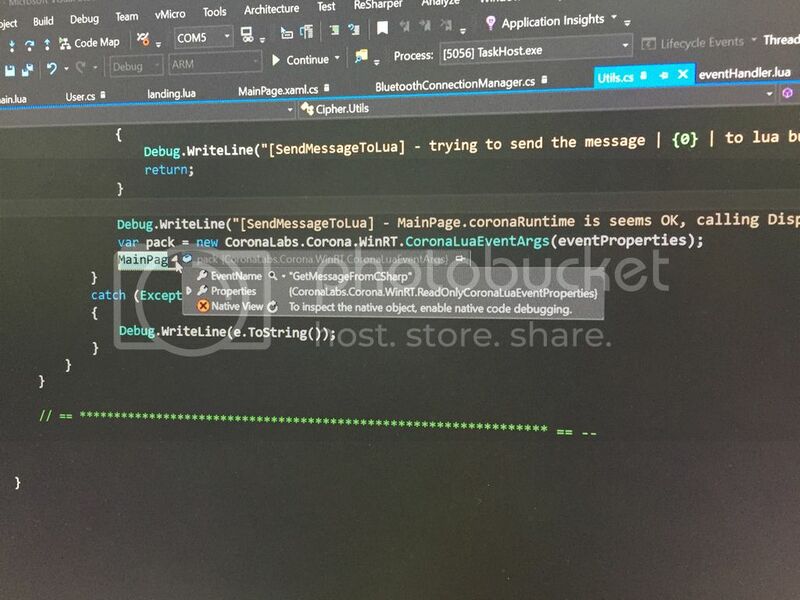 // Add a Corona event handler which detects when the Corona project has been started. Its STATIC because we want to use it from other modules to pass messages to the Lua side. And when calling it (like mentioned above) we get that exception but only after a while. I would suggest that you go over your C# code and check for null references. This is because an AccessViolationException can be thrown instead of a NullReferenceException (due to null reference usage) if the .NET code was called by the C++/CX side of the application. I think it's because Microsoft COM (which C++/CX uses to interface with .NET) catches the .NET exceptions and turns them into less helpful COM errors as I'm sure you're seeing here. If the stack trace doesn't provide any useful info and adding null references checks in the code don't fix the issue, then you'll have to debug it old-school style and start commenting-out code until you've isolated the issue. I did everything i could to try and find the issue, ill appreciate your help here. It has 2 properties (count is 2) witch seems ok since the 1st one should be the name of the pack (to be captured by the lua) and the second is the message i want to add to it. It does sometimes capture the first few messages from c# but then it crashes with the exception mentioned above. The exception states that this is happening in "Cipher.dll" I assume this must be your library, right? As in, your application is named Cipher or your have a separate .NET library named Cipher. You can try to isolate it by putting breakpoints in the .NET methods that Lua calls, because this is likely where the exception is happening. 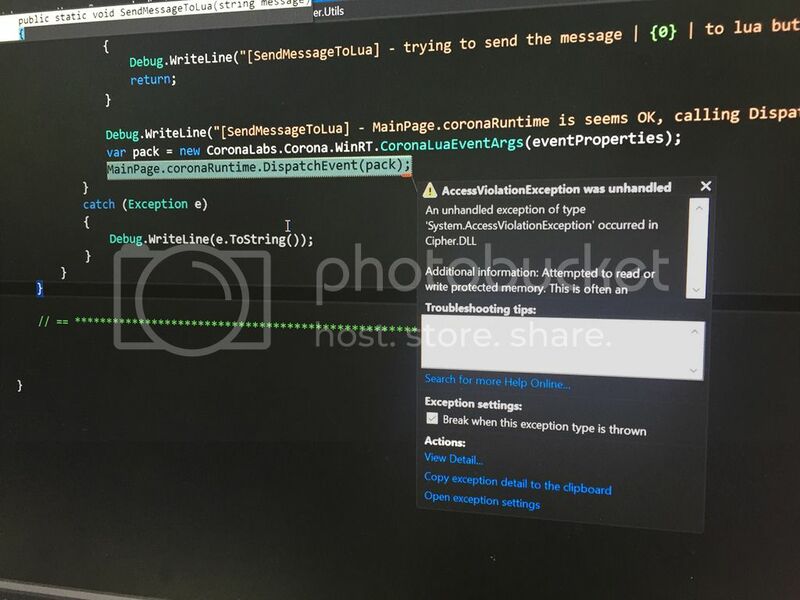 You see, the DispatchEvent() method you are calling in .NET is calling your Lua onGetMessageFromCSharp() function, which in turn is likely calling something on the .NET side in your Cipher library... and the exception is stating that this error is happening somewhere in the Cipher library.